Voice therapists and speech pathologists tell MtF transsexuals that MtF voice change requires long training. They are financially interested to insist that there are no shortcuts, and/or don't know a shortcut because it's not in their books. I know a shortcut, and explain it here. To grasp it is much faster and cheaper (free :) than going to a speech therapist, but requires some effort to reread several times. Popular books repeat each idea multiple times in different words. Here I don't repeat, so you'll need to reread this page until you fully understand every sentence. Then don't skip steps. Melanie Anne Phillips is right that what she calls "resonance" is the most important (a man and a woman can sing the same note, i.e. with exactly same pitch, but you still can hear that one voice is male and another female). But Melanie doesn't explain correctly how she changes her resonance (timbre) because she just changes it while not understanding how she does that. 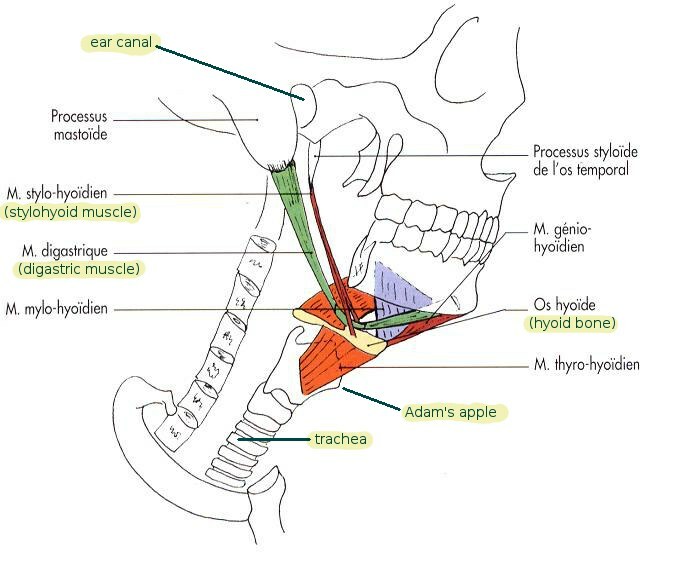 Adam's Apple is a projection of thyroid cartilage - the largest part of larynx (which sometimes is called "voice box"). 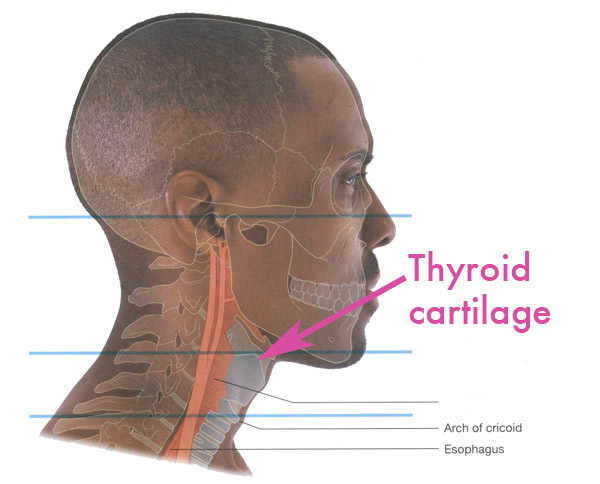 Anterior (frontal) ends of vocal folds/cords are attached to thyroid cartilage on the inside. Trachea (the tube from lungs to larynx) is flexible and extensible a little, like a vacuum cleaner hose. Pharynx (the tube from larynx to oral cavity) is soft and flexible. Larynx is suspended in the neck from horseshoe-shaped hyoid bone at the juncture of neck and head. 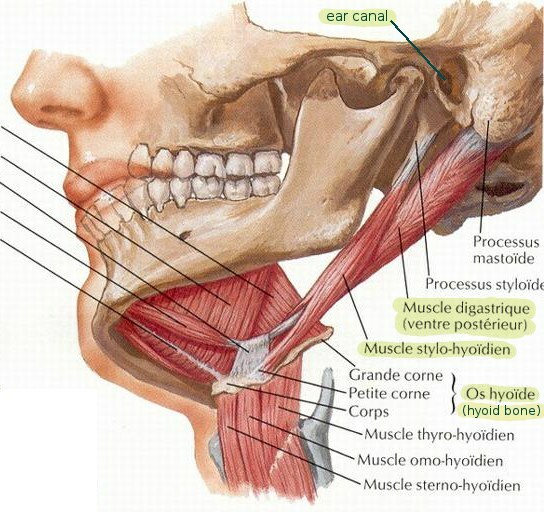 Larynx and hyoid bone together are suspended with three groups of muscles: the first group of muscles pulls larynx downwards (towards clavicles); the second group of muscles pulls larynx upwards and forwards (towards chin tip); the third group of muscles pulls larynx upwards and backwards. 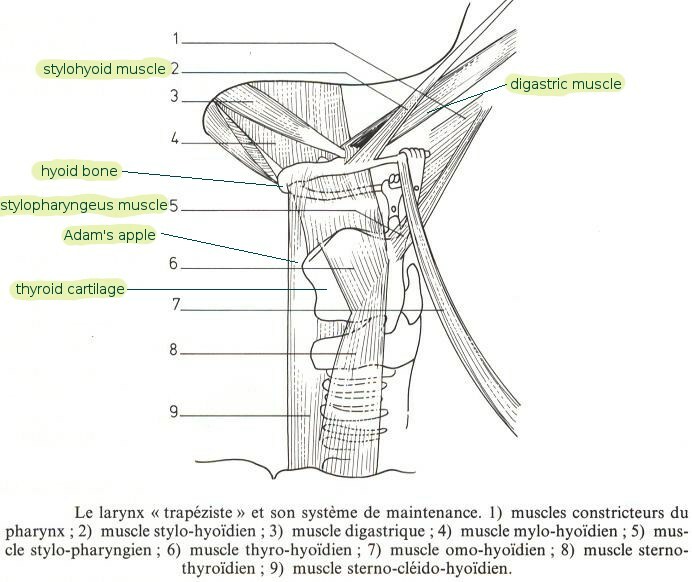 Larynx can be shifted with these muscles in various directions. By will too. There is a common misconception among singers and their teachers about "head resonance" vs. "chest resonance". Indeed there is a very important (for us) distinction, but the resonance really is not in the chest cavity. Place your hand on your upper chest at the center, say "mmmm...". If you feel how your chest vibrates then it's because the first set of muscles (between larynx and clavicles) are strained, so taut muscles conduct vibration from vocal folds attached to the larynx to chest bones. It only seems that the chest resonates, really it just vibrates. The resonance important for us is in the vocal tract from vocal folds to lips. Chest vibration is a sign that you do it wrong regarding voice feminization because that first set of muscles besides conducting vibration also pulls larynx down lengthening the vocal tract. The resonance important for us depends on vocal tract length (longer tube resonates on lower frequencies, so the voice sounds masculine). For voice feminization you need to shorten your vocal tract by pulling your larynx upwards and backwards (the crucial bit about "and backwards" - thanks Rachael on the [voicets] group). As a useful side effect, that also hides Adam's Apple from sight. Frequency of vibration of vocal cords is called pitch, or fundamental frequency (F0), or glottal pulse rate (GPR). It's like vibration of a guitar string. Vocal tract length (VTL) determines frequencies of formants - resonances in vocal tract, like resonances in acoustic guitar body. Imagine that you change volume of guitar body - the guitar will sound different with the same notes played on the same strings. Don't confuse formants with harmonics/overtones. Human ear works like a spectrograph. Formants are peaks of spectral envelope on a spectrogram. Formants, GPR and VTL are terms of phonetics. Speech therapists traditionally don't study recent advances in phonetics concerning importance of VTL as well as GPR for male vs. female voice perception. So they lead the long (paid) way around with various exercises instead of the shortcut. 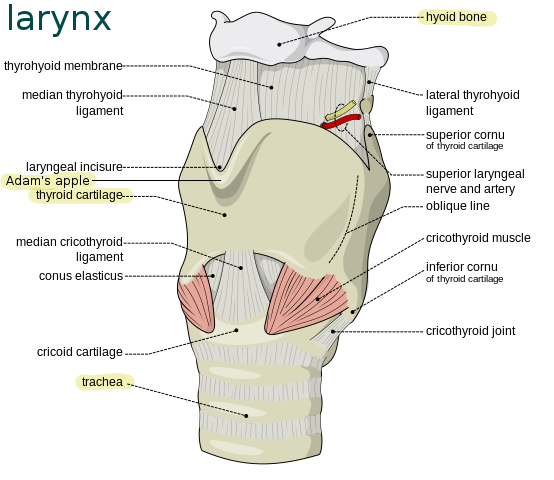 Larynx is pulled upwards and backwards with three pairs of muscles. Their names: stylopharyngeus muscle, posterior belly of the digastric muscle, stylohyoid muscle. Study pictures on three pages linked from this paragraph. You need to understand where these muscles are. Then imagine where they are in your neck. 1. Place your fingers of your throat lightly, swallow, feel how Adam's apple goes up, then down. Look at it in a mirror (or from a side using a web-camera). 2. Swallow again, try to delay its descent. Try to feel inside your neck (not with fingers) the muscles which pull Adam's apple upwards during swallowing. 3. Learn to pull your Adam's Apple upwards and backwards. 4. Then learn to do that during speech. It's the shortcut. Besides delaying larynx descent after swallowing, another trick "to get it" is imagining that you direct sound of your voice through palate towards nose tip. One more way: those muscles are contracted while gargling (for much longer time than during swallowing). Pulling your Adam's Apple upwards and backwards makes the resonance of your voice female. But you'll notice that doing that also makes raising pitch easier. Dr. James Thomas' FemLar (feminization laryngoplasty) surgery nowadays consists from 1) cutting off a vertical strip at the center of thyroid cartilage and anterior parts of vocal folds, stitching the remnants together (that raises pitch and eliminates Adam's Apple), and 2) thyrohyoid elevation (don't confuse with cricothyroid approximation) - he ties thyroid cartilage to hyoid bone. The 1) was invented by a Thai surgeon Somyos Kunachak, but only Thomas does the 2) after Patty studied phonetics and explained about VTL on the [voicets] group and to Thomas. After FemLar vocal folds are not as taut as after cricothyroid approximation (CTA), so they don't stretch and pitch doesn't lower back after few years. But the FemLar surgery besides leaving a scar is very risky: one cough during the first month can tear the stitch, a vocal fold comes loose and you lose the voice altogether; uneven length of cut folds can cause air leak between folds; voice becomes weaker and can become less intelligible. 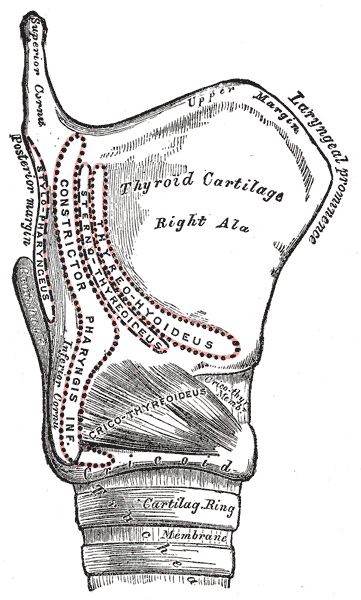 Thyrohyoid elevation pulls larynx up, but you can pull larynx further by will without surgery. Testosterone causes growth of vocal folds and thyroid cartilage, male vocal folds are longer and more massive. Less known fact is that male larynx descends further than female. I suspect that testosterone lengthens stylohyoid ligament. 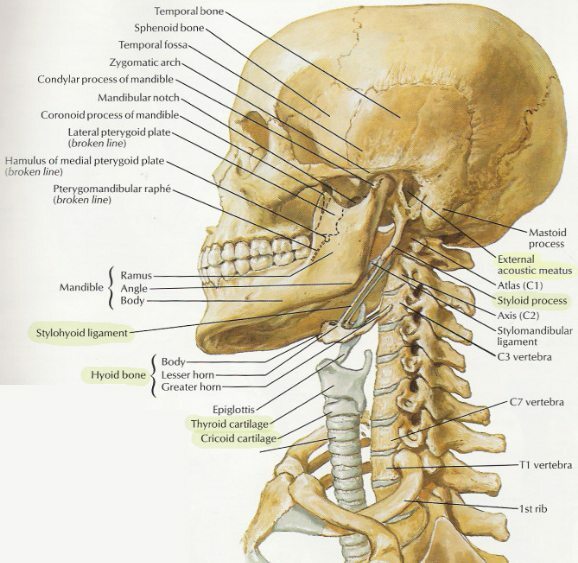 Besides, average male skull is larger than average female skull, so for female VTL you need to pull larynx (with Adam's Apple) (upwards and backwards) further than its usual female position. In order to learn how to make your voice female, you need to reread this page until you fully understand every sentence. Then don't skip steps. Discussion about all this - on the [voicets] group. This page has been accessed 146559 times.